A new study led by Scripps Institution of Oceanography at UC San Diego researchers has revealed that the thickness of Antarctica's floating ice shelves has recently decreased by as much as 18 percent in certain areas over nearly two decades, providing new insights on how the Antarctic ice sheet is responding to climate change. Data from nearly two decades of satellite missions have shown that the ice volume decline is accelerating, according to a study published on March 26, 2015, in the journal Science and supported by NASA. Scripps graduate student Fernando Paolo, Scripps glaciologist Helen Amanda Fricker, and oceanographer Laurie Padman of Earth & Space Research (a non-profit institute specializing in oceanography research) constructed a new high-resolution record of ice shelf thickness based on satellite radar altimetry missions of the European Space Agency from 1994 to 2012. Merging data from three overlapping missions, the researchers identified changes in ice thickness that took place over more than a decade, an advancement over studying data from single missions that only provide snapshots of trends. 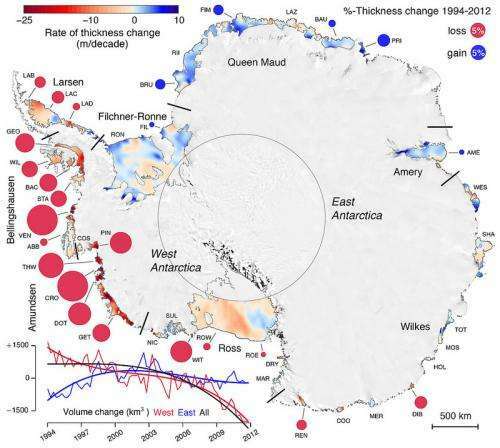 Total ice shelf volume (mean thickness multiplied by ice shelf area) across Antarctica changed very little from 1994 to 2003, then declined rapidly, the study shows. West Antarctic ice shelves lost ice throughout the entire observation period, with accelerated loss in the most recent decade. Earlier gains in East Antarctic ice shelf volume ceased after about 2003, the study showed. Some ice shelves lost up to 18 percent of their volume from 1994 to 2012. "Eighteen percent over the course of 18 years is really a substantial change," said Paolo. "Overall, we show not only the total ice shelf volume is decreasing, but we see an acceleration in the last decade." While melting ice shelves do not contribute directly to sea-level rise, the researchers indicate that there is an important indirect effect. "The ice shelves buttress the flow from grounded ice into the ocean, and that flow impacts sea-level rise, so that's a key concern from our new study," said Fricker. Under current rates of thinning, the researchers estimate the ice shelves restraining the unstable sector of West Antarctica could lose half their volume within the next 200 years. "This work demonstrates the power of satellite observations to understand change in the great polar ice sheets," said Thomas Wagner, Program Manager for Cryospheric Sciences at NASA Headquarters. "And with data spanning decades, we can understand some of the most important changes and their implications for sea-level rise." 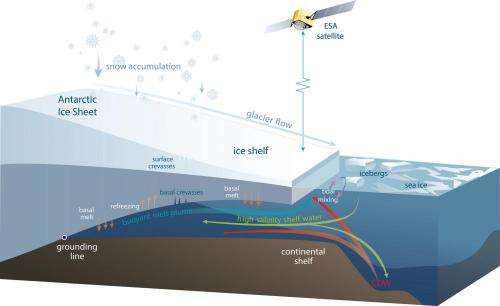 Fricker said future studies will concentrate on the causes behind changes in ice shelf volume, including the effects of the atmosphere and ocean. "We're looking into connections between El Niño events in the tropical Pacific and changes in the Antarctic ice sheet," said Paolo. "It's very far apart but we know that these teleconnections exist. That may ultimately allow us to improve our models for predicting future ice loss." It was true these were shedding more rapidly as well. This should still be happening because of catastrophic failure from ice. "Total ice shelf volume (mean thickness multiplied by ice shelf area) across Antarctica changed very little from 1994 to 2003"
That's a fairly long time for Global Warming to have virtually no effect. I find it interesting that every time there is an article regarding the thinning Antarctic ice, Greg Tyler feels the need to post his misunderstandings of CO2 driven warming vrs mechanical warming. It does not matter how many times or ways it is pointed out that he is wrong, he just plunges ahead and says the same thing on the next article that comes along. Reminds me of Zephyr in many ways. Wow, all that melting going on and yet, Antarctic seasonal sea ice has expanded to the highest levels ever recorded, even during the "warmest year ever". SO, you say that fatuously, yet if ice cools water, and there is a temperature drop, then more ice can form. I am not saying this is happening all the time, but energy is conserved, and heat is being transferred. There is alot of possibility in the tradespace, due to the heat capacity of water, ice and water vapor. Just shows you what fresher water and stronger winds can do. Meanwhile it'll have all melted back by now. This article implies 18% loss over 18 years, then goes on to make a prediction that 50% will melt in 200 years with the accelerating ice melt. Somehow, this math does not add up. Based on current trends, I would expect that 50% melt would take less than 50 years. Am I missing something here? Yes, the ice loss is not linear - its a compounding problem. Well, look at that, the evil CO2 is only melting the ice under which their is intense geothermal activity. But then, in AGW Cult "science" CO2 possess magical properties. Where are your links to "intense geothermal activity? I agree that it could use some explanation, but consider that, first of all, the article is clear that the ice shelves in the west had lost up to 18% - many lost much less. Secondly, as the 1st figure shows and as Maggnus mentions, the ice loss is non-linear. And third, keep in mind that most scientists are very conservative in their statements. Gold nuggets rapidly becoming accessible. Huzzah. The area of melting ice referred to in the above link may be in the same area Scripps is studying. The Scripps press release is a little vague about the location. Ice on the opposite side of the continent, meanwhile, is growing thicker which suggests the melting in the west is likely due to a combination of volcanism and a warm ocean current. At any rate, 20 years of data is not proof of any causative factor except natural variability. There is a helpful figure, with labels. You may notice that the thinning ice shelves mentioned in the article title are glacial ice coming off the continent, while sea ice is what forms on the sea when seawater freezes. Unless you can show that amounts of ice in ice shelves and in sea ice must be positively correlated, you have no argument, yet I have never seen you bother trying to explain the connection. geothermal heating contributes to a few millimeters of melting annually, compared to rising sea temperatures which can trigger rates of up to 100 meters each year. I think the scientists wanted to put out this article because there were a large number of anti-science people that were using the study to claim volcanoes had a significant effect on the melting of Antarctica. 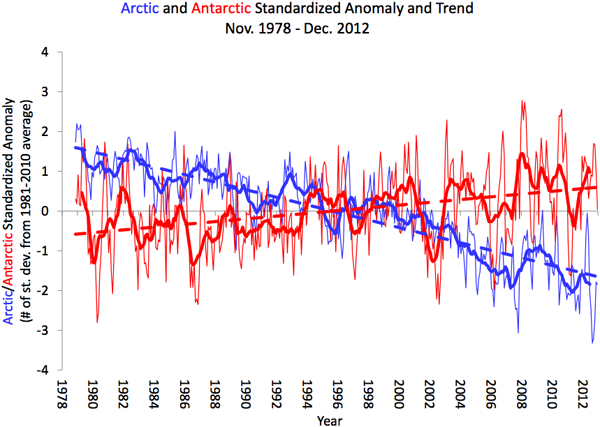 As for "natural variability", since the loss of ice on Antarctica is primarily due to warmer oceans and, since there is an enormous amount of evidence showing that the warming of the oceans is due to the current warming (primarily caused by increases in CO2 levels) and, since there is no evidence of any variability to explain the melting, it seems a stretch to bring up natural variability. Compounding problem, as in compound interest type of deal? Like an acceleration? Sorry, I am still not quite understanding here. If the melt is accelerating as it has been shown to be, then wouldn't that equate to greater ice loss in future melt events? Or am I wrong in assuming that the 18% figure represents 18% volume of current ice? Obviously it depends on the temperature of the ice to start with and the dynamics, something your claimed water bowl cannot address ! Depends & as a claimed "Physical Chemist" u know how to quantify this AND especially so craft a proper experiment to show it and be able to confirm why a brass water bowl with a candle is rubbish. But in all this time & since your arbitrary claims why is it u cannot prove any of your claims ? Y aren't your claimed 4 uni degrees including "Physical Chemistry" on your facebook page ? I am no geophysicist, but volcanic activity has been increasing, so it's possible. Funny how volcanism keeps undermining AGWing CO2. More than 2/3 of the Antarctic is gaining/not losing ice. The only place melting is directly above where there is geothermal activity and yet the AGW Chicken Littles can't see the fraud that is their cult. Evidence for your claim please AND quantification of the amount in Watts/m^2 over what region ? Not being able to support your many claims makes you appear immature, naive & unlikely u have "4 technical degrees" as claimed ? Institute & yr of degrees started please ? Mona Loa is on top of an increasingly active volcano.. Since last eruption was 1984 how is that "increasing" ? And which way does the wind blow ? Any proof of ANY your claims ever by now there are so very many ? Explain please then why the CO2 has seasonal noise or are you claiming Mauna Loa has too ? Water_Prophet with so many claims, his worst is that CO2's effect is a low 0.00009W/m^2 whilst he claims wiki at 1.5W/m^2 is in great agreement ! Gravitational surveys' show a nett mass lost, not gained. Evidence to back your claim please ? The only place melting is directly above where there is geothermal activity and yet the AGW Chicken Littles can't see the fraud that is their cult. Look at article too ! antigoracle, just like ubavontuba & Water_Prophet u shoot yourselves dumbly so often, wonder if u are intimate & related or intimately related LOL ! U are a very stupid liar, CO2's thermal properties have been well known for >100 yrs. Proof CO2's radiative forcing < 1.5W/m^2 please ? Making idle unsupported claims makes u look bad ! What does this even mean, especially "catastrophic failure from ice" ? R u feebly trying to say the antarctic failed from the ice - eh ? Or your mixed up use of 'failure' implies antarctic is failing "as a continent" from failure of ice - what ? You definitely don't write like anyone with "4 technical degrees" ! Key claim u made recently is CO2's radiative forcing of 0.00009 W/m^2, why please can't u show why u have made it so low, it appears faked & whopping 16,666 x lower than wikis - Why ? Making claims refusing to substantiate them makes makes u appear anti-intellectual. Why can't you prove ANY of your claims, whopper ? Yes, we all know you are not a geophysicist. You do not have the math and physics background to understand geophysics. As an example, you are making a comment about the "stupidity" of the scientists who put their sampling system on a volcano. You seem to think they didn't "notice." While that might be true for you, they are real scientists and design much better experiments than you can. Your idiocy is that you seem to think they sample from only one place. I have shown you that they sample from all over the world. You just choose to ignore the facts. Here is the link again. Do you really think we don't know you are aware of the other sampling locations? I have to say a bit more on the comment about Mona Loa being a volcano that Alche/WaterDummy thinks gives faulty CO2 measurements due to the volcano producing CO2. Alche/WD's comment means that he didn't even look to see if there were more measurement locations than Mona Loa, and it is clear that measurements are being taken all over the globe. It also indicates he never looked at the techniques pioneered by Keeling to continuously monitor CO2 and compensate for the CO2 produced by the volcano. Here is the approach they use. Just point out where they are doing it wrong. Why did you not even look at where the measurements are made and how they make sure they are right? Hey Mike, were you born this stupid or dropped as a baby? Take a gander at the image at the top of this article. Less than a 1/3 of the Antarctic shows melting and it's directly above known geothermal activity. thermy, The reason-ability of the scientists is not the issue. Why anyone would put a sampling station on such a dirty source REQUIRING processing is the devil's cane. And a laughable one only the gullible would believe, when there are so many possible pristine locations. Any one knows you need a known to compensate, most increasingly active volcanoes aren't known as "Old Faithful." Alche/WDummy notes that he still believes that taking CO2 data on Mona Loa must lead to errors. However, I passed on the location of more than 100 sites all over the world that sample the atmosphere for CO2. How is it possible for Alche/WaterDummy to state: "And a laughable one only the gullible would believe, when there are so many possible pristine locations." when I have shown him that data are taken at many other sites and they correlate well with Mona Loa. Alche: Do you really think that the location was chosen with the scientists unable to recognize it as an active volcano? Odd you call me dumb. But you defer to Skeptiscience, a website designed by a failed physics major turned artist, and somehow conclude that he knows... something. You don't understand how ridiculous and sorry, dumb, by being referent to such a person. You might as well be referent to me... You'd have more clout. Sorry, bub, it is just true. I can produce both facts and experiments justifying my point. Aka fossil fuels contributing >1/10 of the energy needed to change climate, dramatically, therefore, sufficient energy to change climate. I can show the temperature changes in the Earth are linear with GDP. Both theoretically and experimentally I can show water vapor is more significant than CO2. These, whether you agree with there sufficiency, are strong and positive factors. Can you show a single strong positive correlation with CO2? (CO2's correlation to temperature is weaker than GDPs and thus fossil fuel consumption). Just one strong metric, sans hand waving? antigoracle unfortunately making idle blurts & superficial claims tells us lots about you, back to school ! 2. You have nil understanding of "Experimental Methodology"
4. Claims are sporadic & not well thought through, none of which you can prove ! I claim openly and publicly you are a LIAR & CHEAT ! Lets start with proving your claim of "4 technical degrees", which institute & when started please ? AND why is your highest educational achievement ONLY high school & so long ago as per your facebook page ? Then we move on to all your stupid claims re CO2. 1. WP has difficulty with basic math. 2. WP doesn't understand the greenhouse effect. 3. WP can't find anything wrong with the arguments presented at SkepticalScience, so he resorts to the logical fallacy of ad hominem to try to discredit the site. Sorry, these were buried under a malicious information warfare attack. "Sorry, these were buried under a malicious information warfare attack"
That is ALSO beyond any credibility u had left, for the simple reason there are moderately complex sequences which would have to be defeated AND your ability to edit posts - LOL ! Instead it looks FAR more like a twisted attempt to garner sympathy ! - Wiki is in "great agreement" with 0.00009 when theirs is 1.5 - ie 16,666 greater than yours FFS how? - Those "4 technical degrees"
And another susbstanceless info attack, designed to distract from the inconvenient reality of my previous posts. Y is your writing NOT commensurate with those claiming "4 technical degrees" as u do ? Which institute & what years started please ? This is what the Antarctic ice shelves are doing at the end of winter at northem hemisphere each year. I know, it may look strange and paradoxical, but it's usually replaced with the opposite effect each autumn...;-) Apparently the Antarctic ice does nothing exceptional in terms of long-term average, it just does it faster.